When I was a kid, my favorite thing about Easter was the candy – especially gooey and sweet Cadbury Creme Eggs. Even now I can’t resist buying a package around Easter, although I will freely admit that I can’t eat them like I used too because I find them to be a little on the sweet side. This sweetness is not a bad thing, however, as it opens the door for other culinary uses for the chocolate eggs. For instance, you can make a Cadbury Creme Egg Pie with a whole batch of them. Or, you can turn it into a handy way to sweeten your coffee. 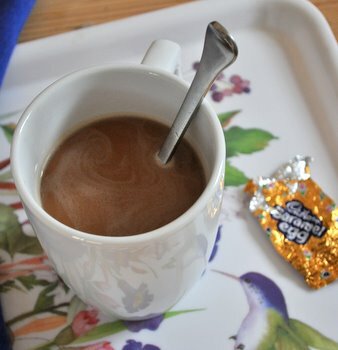 Cadbury Creme Egg Coffee is exactly what it sounds like: coffee sweetened with a Cadbury Creme Egg. All you need to do is dissolve a whole, large egg into a hot mug of freshly brewed coffee. The egg adds a nice sweetness and a hint of chocolate without much effort at all. 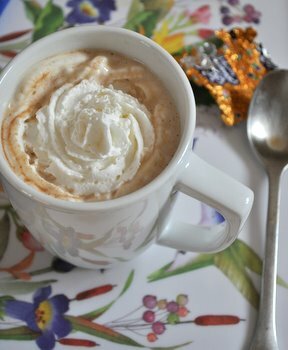 I prefer using the Cadbury Caramel Eggs, which add a subtler sweetness and give the coffee a caramel-latte feel. You don’t need to add milk or cream to the coffee after adding the egg, although a little bit of whipped cream makes the coffee look quite festive if you plan to serve this around Easter. 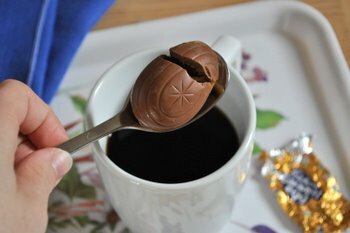 Add Cadbury Creme Egg to a mug of very hot coffee. Use a spoon to break up the egg shell and stir until egg has completely dissolved. Top with whipped cream, if desired, before serving.